Wanted: Midwife/nurse practitioner in Virgin River, population six hundred. Make a difference against a backdrop of towering California redwoods and crystal-clear rivers. Rent-free cabin included. When the recently widowed Melinda Monroe sees this ad, she quickly decides that the remote mountain town of Virgin River might be the perfect place to escape her heartache, and to reenergize the nursing career she loves. But her high hopes are dashed within an hour of arriving: the cabin is a dump, the roads are treacherous and the local doctor wants nothing to do with her. Realizing she's made a huge mistake, Mel decides to leave town the following morning. Carr develops this novel with a flair for scenery. Virgin River comes to life in a big way. I thoroughly enjoyed how Carr allowed me to picture each and every aspect of the area and its people. Carr presents a well-rounded introduction to Virgin River as a whole. At the same time, she creates an emotionally fulfilling, wildly exciting novel that brings all the aspects of life forward. The story was full of plot twists that kept me from guessing what would happen next. There were definitely a few ‘Holy Cow! I didn’t see that coming’ moments that had me exclaiming out loud. I loved this 1st look at Jack. He’s so much fun to get to know. The mix of strong warrior with caring gentleman was fantastic. I appreciate the gradual nature of Mel’s acceptance of Virgin River and of her growing relationship with Jack. I loved Mrs. McCrea. Her busibodyness and hopes for Virgin River’s future were fantastic. 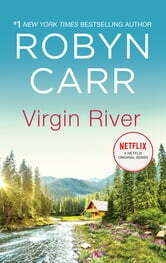 Carr has penned the perfect start to her Virgin River series with this novel. I loved every aspect of it, from the heartbreaking loss to the budding romance, beautiful scenery to frightening suspense. I will definitely be continuing this series and wouldn’t hesitate to recommend the novel to others. Loved the story line and characters. New twists kept it interesting. I had trouble to put the book down and have ordered book 2 in the series. I loved this whole story line. Robyn is excellent at keeping all the characters in the story line Alice through the entire series. Mel and Jack's story is one of love, heroics and learning to "rough it". What a great story. So true to somebody life. Second chances. True love and a little mystery. You will enjoy this hometown story. Love this book. Great series but this is by far the best. Funny. Witty. Steamy. Make you laugh. Make you cry.